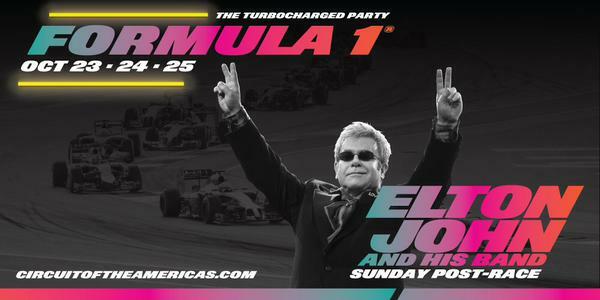 Catch the race and the Elton John show together. The concert is scheduled post-race Sunday and rocks for a full 2 hours. Either enjoy the show from the new festival lawn located in the Circuit’s north infield with any ticket type or purchase your Turn 9 Bleachers tickets and watch the race & the concert from your seats. One of the most acclaimed and beloved artists of our time, his spectacular stage shows are attended by audiences around the globe. Race fans will enjoy a turbocharged two-hour set featuring all of the iconic hits and classic album tracks spanning Elton’s incredible five-decade career on the new festival lawn located in the circuits’ north infield. Accompanying Elton on stage will be his band featuring, Nigel Olsson on drums, part of Elton's original three-piece band, as well as musical director Davey Johnstone (who first recorded with Elton in 1971 and joined the band full-time a year later) on guitar, Matt Bissonette on bass, John Mahon on percussion, and Kim Bullard on keyboards.Elton John is one of the top-selling solo artists of all time, with 37 gold and 27 multi-platinum albums as well as 58 Billboard Top 40 singles in the United States, and he has sold more than 250 million records worldwide. Elton holds the record for the biggest-selling single of all time, Candle in the Wind 1997, which sold 33 million copies, as well as for most appearances on Billboard's Adult Contemporary chart, with his 2013 single "Home Again” marking his 69th entry. He has also written the music for stage and screen successes Billy Elliot: The Musical, Elton John and Tim Rice’s Aida, and The Lion King, which was recently named the highest-grossing stage show or film release in the world.Among the many awards and honors bestowed upon him are five Grammys, a Grammy Legend award, a Tony and an Oscar, a Best British Male Artist BRIT Award, induction into the Rock and Roll Hall of Fame and the Songwriters Hall of Fame, the Kennedy Center Honor, Legend of Live Award, 12 Ivor Novello Awards and a knighthood from HM Queen Elizabeth II for “services to music and charitable services.” Elton has recently been named the first recipient of the BRITs Icon Award, which recognizes the very highest level of British music achievement, presented only to iconic artists whose writing, recording and performances set them apart as having made a lasting impact on the nation’s culture.